Sometimes people need to use an unknown computer to complete a task with Internet and they need to share some personal information there. This may compromise their personal information. When using a public computer, Key logging comes handy to people seeking such information. Key Logging is also known as Keystroke logging or Keyboard capturing. This feature enables information seeker to the recording of key struck on a keyboard. Users do not know that his actions are monitored by anyone else. This is a dangerous feature that compromises people’s personal information like the debit card, credit card and more. To overcome above situation it is always advised that you use an anti-keylogger app, at the time of using a public terminal with your personal information. This will not let other monitor your keyboard strokes. Software named Ghost press can be used to prevent capturing of keyboard strokes typed by you for windows. 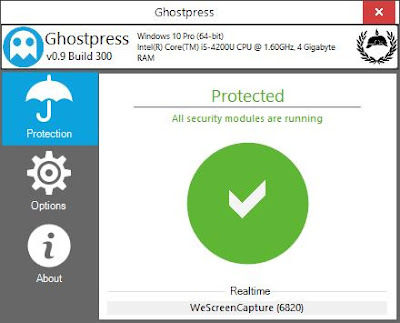 Ghost press is a free and easy to use program that prevents from keylogging. This portable software comes with minimal configuration and very easy to operate. You can use it without installation for the anti-keylogging purpose. You can carry it on a USB drive, where there is no Internet connection. The size of this software is the only 150Kb. You need to run the exe file of Ghost press to activate it. You need not scramble the key presses on your computer Ghost press prevent it from information seekers. By clicking on the green icon, You can block the access. You can add this feature in your PC start-up too. Download Ghost press from here. You may like HOW TO CHARGE YOUR SMARTPHONE WITH CLOSED LAPTOP LID. This atnikeylogger probably is not bad. I don't know. I found recently and downloaded this keylogger https://www.refog.com/ to be sure I will not lose my passwords from some programs. I like this program's design and it is very simple in work.